The photo below dates from sometime before August 1922, when Agota Radauskas Phillips Zakar (1902-1980) came to the United States. Agota is standing on the left. Seated in front of her is her older sister, Virginija Radauskas Palujanskas (1896-1968). 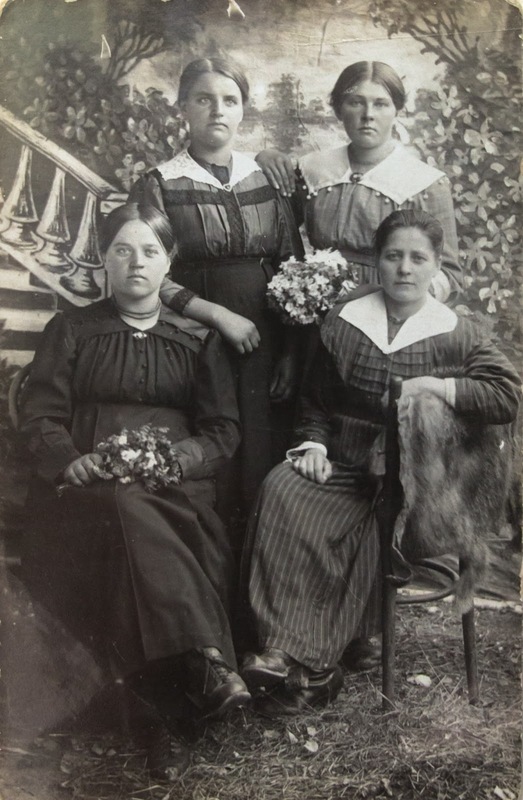 The other two women in the photograph, taken in Lithuania, are unknown. We referred to her as "Agotyte" (pronounced "Ogatete")...She eventually had a farm in Kenosha, Wisconsin, where I stayed for a week visiting her.... I helped in the barn with the cows.... When we all went to Chicago to Bernice Radauskas' wedding in 1966, Agotyte was there and she asked if I wanted to stay for a week. I flew home to Baltimore by myself a week later. I wondered if the "tyte" part of her nickname comes from teta, the Lithuanian word for aunt. But our mutual third cousin in Lithuania, Osvaldas Guokas, tells us "Agotytė...is level of diminutive. 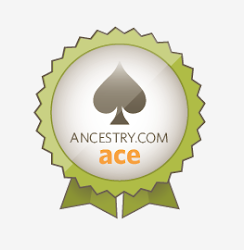 Agotytė is pronounced in English like Agoteete." 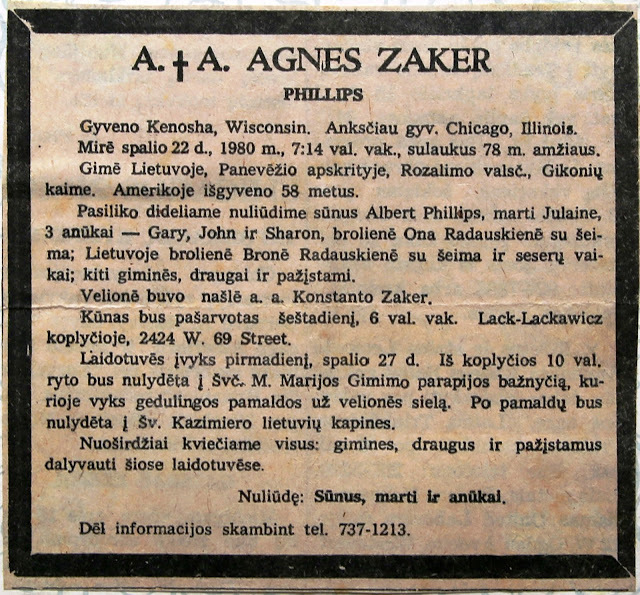 Agota's obituary, below, I believe came from Draugas, the Lithuanian newspaper in Chicago. Lived in Kenosha, Wisconsin. Before lived in Chicago, Illinois. Died October 22, 1980 at 7:14 in the evening, she was 78 years old. Born in Lithuania, Panevėžys county, Rozalimas district, Gikoniai village. Lived in America 58 years. She leaves in sadness son Albert Philips, daughter-in-law Julaine, 3 grandchildren - Gary, John and Sharon, brother's wife Ona Radauskienė with family; in Lithuania brother's wife Bronė Radauskienė and family and children of sisters, other relatives, and friends. She was the widow of Konstanto (Konstantinas) Zaker. The obituary goes on to say (from what I can figure out from other sources) that Lack-Lackawicz at 2424 W. 69th Street in Chicago is the funeral home, and the service will be at Nativity B.V.M. Church (Svc. M. Marijos Gimino). She will be buried in St. Casimir (Kazimiero) Lithuanian cemetery. Photos from the cemetery will be in the next post. Both the photograph and the obituary came from the private album of Aldona Radauskaitė Zigmantavičienė, the daughter of Steponas Radauskas, a brother of Agota and Leo. Thank you Aldona! Thanks also to Osvaldas, who has been sharing all these photographs and information with me!